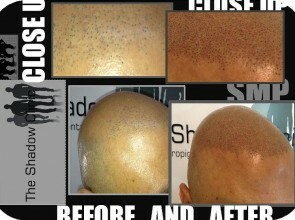 Are you interested in Scalp Micro Pigmentation. Are you sceptical about the concept of this treatment. That’s ok, you should be. This procedure is life changing to say the least, the more research and understanding of The Shadow Clinic’s procedures will help you integrate smoothly into our new age treatments for Men Suffering from Hairloss. At the Shadow Clinic we believe the most assuring and educational aid to understanding this treatment is seeing it. If a provider can not offer you prior treated clients to view their results it may be wise to find one that can. The Shadow Clinic offers this option. You are able to meet up with a previous Scalp Micro Pigmentation client to see our work. Many uncertain clients have a coffee and chat with one of our more then happy post clients and find it very eye-opening. This is at no obligation to you, you only need to make time to meet up. Call us today to arrange your meet up with a client or for any other questions you may want to know about our Scalp Micro pigmentation procedures.